Unlike copper-based telecommunications, fiber optic cables transmit data faster, more reliably and without the risk of electromagnetic disturbances. As of 2006, submarine fiber optic cables accounted for 99 percent of all international data exchanged. Today, 25 percent of internet data usage in the United States is over fiber optic cables. Fiber-optic cables currently extend more than 113,000 miles throughout the U.S. As the cost to maintain DSL and Cable infrastructure approaches the cost to install new fiber-optic cables, internet providers will likely increase fiber optic coverage in the U.S.
We have stripped apart how these fiber-optic cables work, revealing how microscopically thin glass tunnels deliver data at the speed of light between computers, countries and continents. Fiber-optic cables can contain several hundred fibers, each about one tenth the thickness of a human hair. To ensure the light particles, or photons, being transmitted do not escape, a layer of cladding covers the fibers. Most cladding is infused with boron and germanium, which assists in keeping the light waves contained. The fibers surround a solid core for strength and any gaps are filled with an insulation of plastic coating, often with kevlar fibers. A copper sheath and waterproof barrier typically surround the inner components. Some cables even have two additional layers of steel to prolong the useful life expectancy. Finally, a plastic coating, usually polyethylene, is added for durability and moisture resistance. The science behind fiber optics builds on the work of Irish physicist John Tyndall. In 1854 he demonstrated that light traveling through a stream of water will bend to follow the water’s path. Like the light in Tyndall’s experience, information is passed through a fiber-optic cable by shining light, which bounces off the glass walls of the cable. 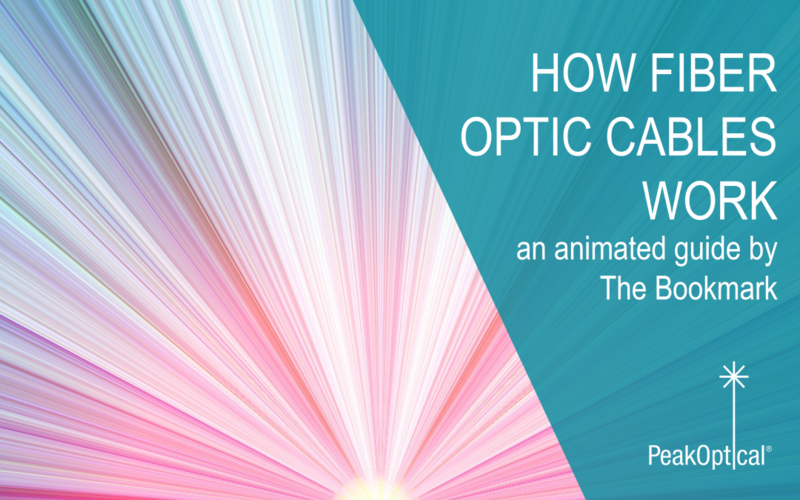 For the light to be reflected, it must approach the fiber’s glass wall at what is known as the critical angle. Above this angle is where the glass wall acts like a mirror, allowing the photons to bounce off. If the photons collide with the boundary at an angle less than the critical angle, the light will escape, or be refracted. This is called total internal reflection. Fiber-optic cables transmit data through pulse code modulation, which converts your analog data into binary, the language of computers comprised of 1’s and 0’s. Quick flashes of light transmit this string of binary data. A flash represents a “1” and an equal period of darkness represents a “0”, similar to Morse code. The signal originates from a transmitter, which focuses light into the fibers. Once the binary string has been successfully delivered to the receiving station a photocell optical receiverconverts the light into an electrical signal. This is no small task as the signal is traveling over 120,000 miles per second! Even when traveling at such speed, the signal in a fiber-optic cable gets dimmer due to impurities in the fiber. The signal must be amplified so it can reach its destination. In order to submerge fiber-optic cables, ships are equipped with specialized tools like cranes, plows, massive spools of cable and remotely operated vehicles. When submerging cables in shallow waters, such as on a continental shelf, a crane lowers a 32-ton plow to dig a trench for the cable on the seafloor. Once the cable is in the trench, the remote-operated vehicle fills the trench and safely covers the cable. Even with this protection, cables can still break due to anchors, earthquakes and fishing nets. Fiber-optic cables have greatly improved global communications and have become increasingly popular as a way to transmit data quickly. The majority of cables installed in the last two decades have been between the U.S. and Asia, as their mutual economic influence and communication requirements continue to expand. With over one billion new internet users projected to come online by 2020, new fiber optic cables will likely follow the linear growth in bandwidth requirements.